When you need to rebuild your vehicle’s transfer case, you have to know that the rebuilt components will function just as well as the OEM transfer case, if not better. That means you need to have confidence in the transfer case rebuild kits you use to complete the job. The aftermarket components and rebuild kits you use to rebuild your transfer case have to fit right into your vehicle as well as the original parts. If not, you not only sacrifice performance, but you run the risk of potentially serious long-term damage to your drivetrain. That’s why when you require high-quality transfer case rebuild kits, the place to turn is always ProActive Gears. We have more than 35 years of experience sourcing the highest-quality transmission components from the world’s leading manufacturers. The long-term relationships we have with these manufacturers mean we’re the world’s premier source for essential components like transfer case rebuild kits. The components and other essential parts we sell are all manufactured to precise OEM specifications, meaning everything will fit together perfectly and mesh with the existing OEM components for Chevy, GMC and Ford vehicles. We also provide all of the components needed for transfer case rebuilds at the best prices on the market. 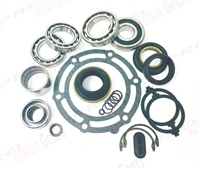 ProActive Gears has an unbeatable extensive selection of transfer case rebuild kits, listed below. When you choose to work with us for your aftermarket transfer case components, you’ll not only receive the best components, but you’ll also take advantage of our extensive expertise and exceptional customer service. Because we have nearly four decades of experience in the industry, we know exactly what it takes to help our customers find what they’re looking for, and we can do the same for you. There’s no better source for everything you need to rebuild a transfer case than ProActive Gears. Take a look at our selection below and then reach out to us to place an order or get more information.